As most homes around the nation are built to cater to families that own cars, having the best garage door security (GDS) possible installed at home is essential. For one thing, the garage itself can be the most enticing place for burglars to break into and raid given the fact that many families store a lot of stuff in the garage other than just their vehicles. Other than the cars, the garage can be used to store items like bicycles, lawn mowers, gardening tools, computers and several home improvement projects and tools to name a few. In many cases, the garage is often where one can find the entrance to the home’s attic where some various items are placed like old books, clothes, paintings and more. Just how can the homeowner secure the garage? To put things in perspective, the garage always has its door (the garage door) which can be closed or opened with the use of a machine called the garage door opener. The openers are controlled via switches that are placed by the way (normally placed near the door leading into the home for convenience) as well as via remote controls installed in the vehicle. Those are the basics for having a functional garage door. When it comes to garage door security, one can visit a local security specialist or search online for whatever products, techniques and services can be availed. For one thing, having door opener security is a good way to start. This means getting technology that ensures the changing of security codes each time the garage door gets opened, and in fact, this very technology patches the security loophole that often comes with remote controls. In the past, it was easy for burglars to steal security codes of the homeowner via cellular phones and be able to use them to open garage doors using different remote controls. Current technology available solves this problem thanks to the use of billions of possible codes that the homeowner can use conveniently and safely whenever he or she opens the garage door. Another way of securing the garage door is by using a keypad security that happens to be installed with many garage doors offered in the market. All the user has to do is input a numerical code, and he/she must take the responsibility of changing the code from time to time in convenient fashion. If the garage door is not stable enough, one can use a variety of materials to enhance it. It is possible to use a metal rolling overhead door to replace the wooden material. 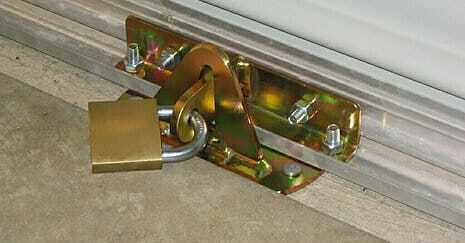 Lastly, the old-fashioned locks are still very useful as they add a lot of strength for garage door security. If the homeowner finds the tasks hard to do on his/her own and needs special service for security of the garage door, he/she can call a local garage door repair experts and invite the expert to examine the garage door for possible on-site work. The good news is that many security service providers nowadays offer packages that come not only with labor but also with a set of garage door accessories such as exclusive garage door locks, deadbolts, alarms, base defender and more. There is no doubt that securing the garage is a must, even in the safest and most quiet neighborhoods. To understand the essence of garage door security fully, one can start by reading the garage door reviews (to gain insight on the value of the current garage door at hand) and home improvement articles followed by consultations with the local security service provider or home improvement experts. 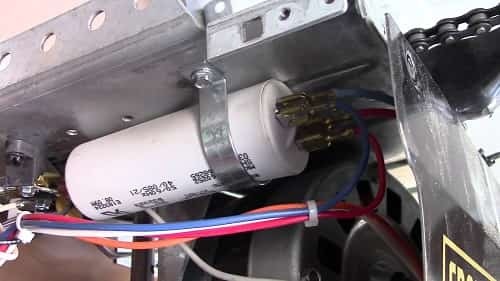 I think that most of you would save money if you would take care of some minor garage door opener problems yourself. I managed to think of several problems that appear the most in Metro Vancouver BC households, or should I say garages. We all know that mere pressing of a button or key in the remote does the job – opens and closes the doors. The design of such garage doors incorporates many electronic components, and the failure of any of these can lead to erratic operation of the door. Some of the minor problems can be taken care of without seeking any help from a professional given that you know what the different components of the system are and how they work. If the door can be opened using the internal button but wouldn’t open with the remote, the problem is certainly with the remote. You may replace the batteries and see if it works. It fails to work; you should check its program, using instructions provided by the manufacturer and reprogram it. If it still refuses to work, you need to buy a remote as in all probability the remote itself is defective. Leave aside the remote; the garage door refuses to open even with the internal button. In this case, you need to ensure that the motor is running. There might be some debris on the tracks blocking the movement of the door. If you find everything to be in place and yet the door wouldn’t work, it is time for you to ask for some Garage door professional help. It indicates some problem with the opener which could need some repairs. The most common reason for this kind of malfunctioning is inadequate lubrication of the tracks. Otherwise, it could be due debris that gets collected in the tracks. So, the correction is very easy. Just clean the tracks of debris and lubricate the same properly. If the garage door begins to open or close on its own, most likely there is a short circuit in the wiring or transmitters. First, check the transmitter for any short circuit. A short circuit in the transmitter prompts it to send signal continuously. So, the door appears to be closing entirely, but no sooner the arms run and the carriage surpass the downward limit to hit the header, the action is reversed and the door starts to open. Remove the batteries from the transmitters and try again. If the problem persists, it indicates a short circuit in the wiring and needs replacement. The present generation of the garage door opening systems is technically advanced and uses monitors that display the likely cause of the problem and also its troubleshooting tip. That’s indeed of great help to users of such doors as it saves them the time and trouble of detecting the problem. You can expect such systems to offer trouble free performance if you just take care to perform routine maintenance as suggested by the manufacturer. That’s indeed of great help to users of such doors as it saves them the time and trouble of detecting the problem. You can expect such systems to offer trouble free performance if you just take care to perform routine maintenance as suggested by the manufacturer. Q: How do I know what size garage door I need? A: Most homes have typical sizes for their garage doors. A standard single car garage door would measure 9′x8′, and a standard double car garage door would measure 16′x8′. When you’re getting a new garage door installed the technician will take expert measurements to make sure you’re getting the right size. To get an idea for yourself, measure the finished opening width and then the height. Q: Do garage doors require maintenance? A: It’s usually a good idea to provide regular maintenance for your garage door and garage door opener. Salty breezes from the ocean, sunlight, heavier-than-normal use and extreme temperatures can cause your garage door parts to wear quickly, and regular check-ups and lubrication can prevent expensive repairs down the road. You can even extend the life of your garage door with routine maintenance. Q: Is it possible to only replace sections of my overhead garage door? A: Yes, it is possible. If your garage door has been hit by a car or other object and only one or two sections of your garage door are damaged, you can contact the manufacturer to see if those parts are available. However, many garage doors are sold as a single unit, making it difficult to find individual sections, and some older garage doors might not be manufactured anymore. Additionally, the cost of replacing one or two sections of a garage door might not be much less than replacing the whole thing with all new parts. Q: What’s the difference between torsion springs and extension springs and how can I tell which ones I have on my garage door? A: Torsion springs and extension springs both help to open and close your garage door, but torsion springs work when pushed and extension springs work when pulled. Most modern overhead garage doors use torsion springs, so the chances are that’s what you have. A certified technician will be able to tell which type you have and perform a replacement. Q: Can I manually open my garage door? A: Yes, there is a red release cord on every modern garage door opener that you can pull to disengage it from the motor and put the system on manual. This is useful if there is a problem with your garage door opener or the power is out. Take caution when doing this with a garage door in the open position as it could potentially slam down. Q: There was a loud noise in the garage, and now the garage door won’t open. What’s the problem? A: This is probably a broken garage door spring. Garage door springs make a loud noise when they snap, and it’s impossible to open your garage door with a broken spring. This will require a service call. Q: Can I replace only the broken spring or do I have to replace both springs? A: It’s always recommended that you replace both springs even if only one is broken. Garage door springs work equally, which means they wear down equally. Putting a new spring in with an old one will cause an uneven balance and could pull your garage door off its tracks or cause expensive damage. Some warranties are only valid if both springs are replaced at once. Q: The light on the garage door opener turns on, but the door doesn’t open. What’s the problem? A: There must be a problem in the mechanics of the garage door opener (the light indicates it’s getting electricity and should be working). If you have an old garage door opener, you might consider replacing it. Either way, this is something that must be attended to by a certified technician. Q: The garage door won’t close all the way, or will close and then open again. What’s the problem? A: This is the result of one or both of your safety sensors thinking there is further to go before the garage door is closed and usually needs a close limit switch adjustment. You should also check to make sure there aren’t any objects in the path of the garage door that could be tripping the sensor. Q: Can I do garage door repairs by myself if I have the right tools? A: It’s never recommended that you attempt to perform a garage door repair by yourself unless you have the right training or are assisted by a professional. Garage door parts can be very dangerous and cause significant damage or injury, so play it safe and call a professional. You could also be voiding a warranty by performing your repairs. Q: Can thieves get into my house by using my garage door opener codes? A: Garage door openers communicate with remotes using codes, and some old garage door openers use a single code which can be duplicated by thieves. Newer garage door openers use rolling codes to make duplication impossible, keeping you safe. If you have concerns about your particular opener, contact the manufacturer to ask if it has this safety feature. If it doesn’t, you might consider upgrading to a newer model. Q: Should I be worried about my garage door opener if it was manufactured before 1993? A: Yes. Garage door openers manufactured or installed before 1993 do not have required standard safety features that are highly valuable in preventing accidental injuries and deaths in children and pets as well as preventing property damage. Current safety features, including automatic reversal and photo-electric sensors, are now mandated by law and a professional garage door repair company should refuse to perform repairs on an opener that old because it is so unsafe. If you have a garage door opener from 1993 or earlier, replace it as soon as possible. Q: What safety features do garage door openers have to keep kids safe? A: Modern garage door openers come with a variety of safety features designed to keep kids and pets safe, including automatic reversal, photoelectric sensors, and pressure-sensitive sensors. Should any of these sensors be tripped, your garage door will automatically reverse and not close until it detects that it’s safe.